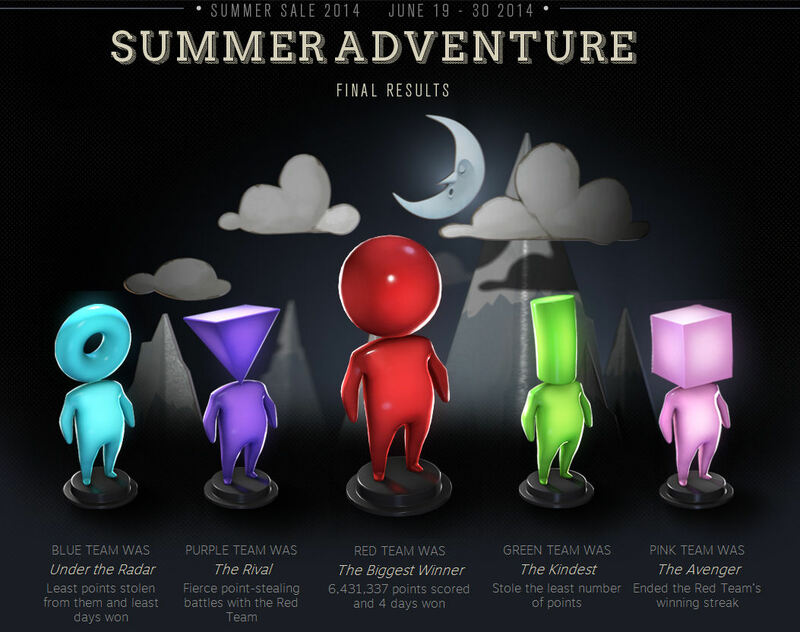 Another Steam Summer Sale has come and gone. As others have noted, its regularity… and the fact that we get a Holiday sale in December… has taken some of the edge off of the whole thing. Seeing a whole pile of games marked down was a huge deal the first couple of times we saw it. Now, however, we have come to expect it. Such sales have changed my behavior some. If there is a game I have to have right away, I still buy it right there and then… unless the sale is around the corner. Steam screwed me on that last year. 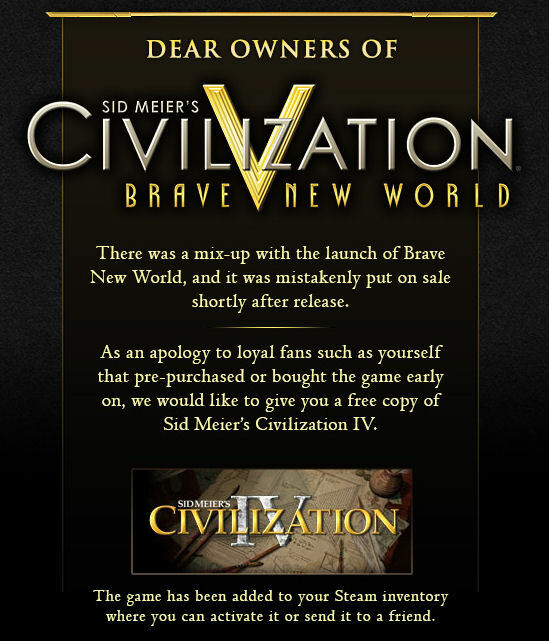 I bought the Brave New World expansion for Civilization V the day it launched, despite the summer sale coming up. And then two days later the Summer Sale launched and the expansion was marked down, a gaffe that even Steam realized might have been a discount too soon. So maybe I won’t pre-order anything that will launch close to the sales zones any more, but otherwise my behavior on must-haves has not changed. But for things I am not sure about, games that are not “must have” but merely nice to have… the Steam sales process has changed my behavior quite a bit. My wish list is now filled with things that I “sorta” want, if the price is right, and I am in a good mood. The impulse buy aspect of Steam sales has been replaced by watching my wish list. I look at what is on sale that day, then look at my wish list, ponder if anything is “must have” at their current price, and then move on, generally without buying anything. This year I did end up buying a couple of games. One was for the strategy group “next game” plan that I wrote about last week, and which makes a good example of how Steam has influenced me. While we had a list of potential games, Total War: Rome II was the primary contender, backed by Loghound. (I had other suggestions, but I wasn’t sold on any of them.) A not-too-old release, it still has a list price of $59.99, the current benchmark price for AAA games from major studios. 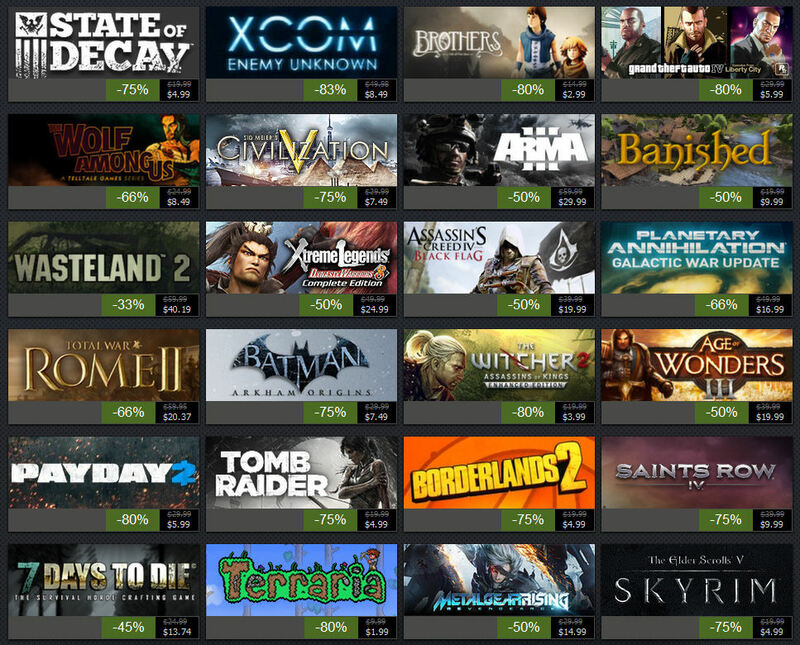 As the summer sale was already in progress, it was marked down to half off. $29.98 wasn’t a bad price. There is a whole lot of game there. But Steam has taught me to always wait until the REAL DEAL has been offered. So while Rome II was the prime candidate, nobody moved to purchase it until Friday, because it wasn’t until Friday that the REAL DEAL kicked in and the price dropped to $20.37. At that price it was an easy purchase and all of us picked up a copy. So that is the tentative next game for the group, once we finish up our Civ V game (at some point in August by my guess) and if it turns out to be suitable. A quick look shows a battle style that gives you a budget to buy units in advance, so I suspect this could mean long lead times before we actually play. But the single player campaign looks to be worth the investment, so even if we don’t play it much, it was probably worth the money with the deep discount. So there it is. Our next game has been chosen. I did have two impulse purchases, one of which was Europa Universalis IV, as it had been marked down to $9.99. It has been on my wish list since it launched, so I am not sure if it is really an “impulse” buy, but I grabbed it. It is one of those games… like its predecessors… that I really want to like, but which is so complicated and so deep that I can never get into it and actually play. I spend most of my time trying to figure out how to do simple things, which quickly becomes frustrating. I have no reason to suspect that this will be any different. The other was Ticket to Ride, which I already own on the iPad. I should have just stuck with that. The iPad version is the game as it should be played and as it should look and perform. The Windows version is slow, graphically inferior, and prone to buffering mouse clicks as you wait for it to catch up, leading to many a mis-played moment. I regret this purchase and I could not recommend this on Steam even at its very low sale price. And, in a sale related matter that isn’t really about Valve or Steam, I was just a tiny bit annoyed to see Planetary Annihilation early access up on the list of things on sale… or even available at all. I backed their kickstarter, but not at a level high enough to get early access yet. I get a finished copy and that is all, but I actually paid more for that than the early access sale, which also gets you a full copy. And Uber Entertainment, the studio behind the title, hasn’t been the best about communication when it comes to actual progress towards release, they are a year late at this point, and they are out there hawking early access at retail. I realize early access is basically a retail pre-order, but it still makes me think, “Dude, remember me? I gave you money nearly two years ago?” Just the nature of Kickstarter projects I guess. And then there was the contest. In order to spice things up… and get people to spend more money… Valve put everybody on teams and set us against each other for the possibility of getting something for nothing… assuming you didn’t buy anything for this gimmick. Clockwork over at Out of Beta covers the whole thing better than I, I just want to grouse about the level of exclusion. Anybody who wanted to participate got dropped onto one of the five color teams. However, to actually do anything to help your team, you had to be level 10, at least as far as I could tell. So despite years of Steam usage and owning over 100 games, I wasn’t able to play because I was only level 7. While that was up from where I stood last year, it still wasn’t enough. The problem is… well one of the problems I suppose… is that I purchased most of my library before they got into the whole levels thing. And one of the prime ways you earn points to level up is based on how much money you spend, so most of my purchases didn’t count. The other problem is that I am not inclined to spend money just to level myself up on Steam. But that probably excluded me from the Summer Adventure thing anyway, as Clockwork pegs the whole thing as a pay to win affair. And, on the annoying front, one of the ways I could have earned a few badges and points was by voting on the content of upcoming sales. Only you must be level 8 to earn anything by voting, so once again Steam failed to engage me by imposing what looks to be an arbitrary level limit on rewards. Bleh. So, the score for the event. Maybe I will be the “right” level for whatever event Steam has planned by the time the Holiday Sale comes around. This entry was posted in entertainment, Kickstarter, Steam and tagged Civilization V, Europa Universalis IV, Planetary Annihilation, Steam Summer Sale, Ticket to Ride, Total War: Rome II on July 1, 2014 by Wilhelm Arcturus. Just a quick note if you backed Planetary Anihilation on Tier 15 or 20, you already have access to the game. @Jesus Medina – Unfortunately, unlike other projects working with Steam, they haven’t actually sent me a key or anything. I file away all their updates and messages, but haven’t seen anything that gets me in yet. I bought Europa Universalis IV and Civilization V, then the last day impulse bought Dragon Age: Origins. I bought the new Wolfenstein during the sale, but somewhere else at 20% off. Of course, 5 days later it was on the steam sale 50% off. I pretty much stopped buying on Steam. One day, I bought a game on sale for $19.99 (50% off – sounds like a good deal!). less than 24 hours later, it was on sale for $1.99. Not a typo. 90% off. Anything less than 24 or 48 hours should be subject to credits or refunds. They said no, I stopped buying. The endless drip drip drip of detail about the Steam Sale on MMO blogs I read is having a strange effect on me. On the one hand its making me vaguely interested in playing non-MMO video games (I believe I’ve played three in the last fifteen years – BG2, DA and a replay of Broken Sword 2). On the other hand it’s making me notice how frequently a number of “MMO” blogs I read write about non-MMO games and how infrequently they write about MMOs. It also makes me wonder where they find the time. The Planetary Anihilation team gave practically every backer a Beta invite back in November I believe. I had to do some digging but on November 19th they sent out update #49 stating the intention to send an invite code to everyone that backed at the $20 level or above. I got my invite code the following day though it came directly from Uber instead of through Kickstarter. @Whorehay – Interesting, I see that update in my inbox, but I have nothing from Uber, and my account on their site has squat. They appear to have missed me along the way. My account is active, and I did the claim link to validate my pledge ages ago. Time to contact support I guess. Bleh. This is the first year I’ve had time and extra cash to pay attention to the steam sale. I was able to get 18 games with an average discount of 85% off. Not counting many of those came with all the released DLC so my savings from buying them when they first came out is even better. It is quite frustrating though having to check back every 8 hours or so just trying to get the best deals. Now I have too many games, but I won’t have to go looking for new games until next year. I almost made it through the Steam Sale. But Baldurs Gate 2 Enhanced Edition, Shadowrun Returns (and expansion) and Endless Space were all on my wish list and all went on sale. I agree with Zep, it’s been a few years that I played Ticket To Ride on PC (I think it was shortly after launch, got it for free with the board game) and had no problems at all, but only played on the LAN and not online, iirc. On Ticket to Ride, I can only say that the HD version for the iPad set a very high bar for expectations. The Windows version feels like a port from another platform and, as I noted, buffers mouse clicks at inappropriate times, which is a pet peeve of mine. @Bhagpuss – Who says we have the time? We all complain about unplayed games in our Steam library. And, in any case, not playing your MMO of choice can free up a surprising amount of time in a given evening. @Random Poster – I bought Endless Space at a previous sale. Haven’t had time to sit down with it yet… heh. I’m gonna defend Steam here with the level restriction; while I empathize with your feelings of exclusion from the event by no direct fault of your own, they (Steam/Valve) had to implement some level of control so that we didn’t end up with the scenario last time where new accounts used those coupons and bits of rock to hoard all the gifts by simply trading to themselves with all their “alt” accounts. II made up some XP by crafting game badges. You can sell cards for one game and complete a set for another by buying off the market. Granted it is only 100XP per badge but hey…. PS: I picked up PA at sale and am very happy – can we still be friends?